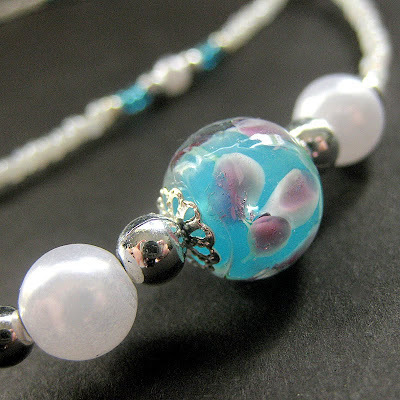 Pretty pink and white peony petals float in a sea of Caribbean aqua blue in a beaded eyeglass holder made of a collection of lampwork beads on a beaded white strand with silver accents. I love these beads and I absolutely adore working with them. These in particular with their soft but vibrant color really stand out for me and they make this eyeglass leash one of my very favorites that I've made thus far. If you're like me, finding your reading glasses when you need them can often be a timely activity. In fact, my mother is even more notorious than I for losing her glasses and was the reason I started making these eyeglass lanyards in the first place! You can solve that problem by wearing an eyeglass chain that hooks to the arms of your glasses and lets them dangle securely (and in this case, decoratively!) around your neck. Each strand I make is made with smooth beads at the nape for the comfort of the wearer and decorative beads at the ends to show off a sense of style while keeping eyeglasses easily in reach. This piece is 29.5" from tip to tip - 75 cm in length. This handmade beaded book thong is perfect for books, journals and more. I made this piece with a combination of seed beads in white in a long cord to make up the body of the thong and lavender and gold seed beads near the end where they'll peek out of the edge of the book and add a splash of color. 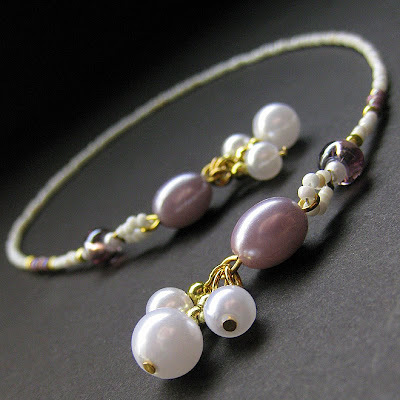 The ends of the length are then finished with weighted pearls clustered on either end in lavender at the top and a dangle of white beneath. Our bookmarks are sure to mark your place with your own personal style without damaging book's pages by the commonly used corner-folding methods. I use my own bookmarks not just in books I'm reading but also in my date book and journal to make it easy to turn to the current day's log.